With her father absent, CeeCee Honeycutt is left alone to deal with her mentally ill mother until tragedy strikes, taking her life. Swept off to Savannah to live with her Great Aunt Tootie, CeeCee struggles to come to terms with her mother’s death, her father’s neglect, while navigating her new world and the incredible women that inhabit it. Saving CeeCee Honeycutt was such a heart-warming read. How I loved little CeeCee! She was so sweet, brave, confused and tried so hard. She wasn’t the only character that grabbed me either - this chorus of eccentric and strong women had me smiling, laughing and constantly wondering what was coming next. This novel moved me to tears – incredibly, within the first 50 pages! I loved the relationship CeeCee had with her neighbour and how sweet they were together. In fact, I loved all the relationships she had with the other women in this charming tale. There were strong female roles in this novel, but never were they overbearing. Rather, it was subtle strength portrayed through their rich, warm characters. Seeing the world through CeeCee’s eyes was so inspiring, and her naivety was charming and amusing. This novel had colourful imagery, great scenes and some brilliant dialogue where the women help CeeCee adjust to her new surroundings and offer her all sorts of advice, leading to some marvellous quotes that can be taken from this novel – don’t want to include spoilers so won’t list any of my favourites here! Don’t miss this heart-felt, uplifting read. Completely gobbled up this novel, couldn’t put it down and was sad when it ended- more please! I was actually completely surprised by it and I am really happy when I pick something up that seems like I might be iffy on and find it fabulous! Beth Hoffman’s story is written simply but with a lot of depth of emotion. She accomplished this I think by moving the story along using small, visually vibrant scenes which somehow makes the story lighter to read. Given that the start of the novel is quite painful this was a great way to write it for the reader-so that we wouldn’t get too depressed. CeeCee Honeycutt comes from instability at home and as a very young child has to put up with a lot of grown up situations because her mother isn’t mentally present and her father isn’t physically present. CeeCee though, is a delightful character and is charming for the reader and when she is sent to her great-aunt Tootie’s to live she is finally given a home. 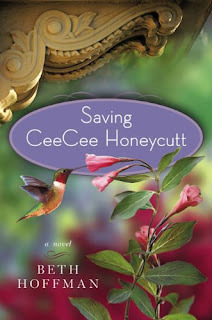 My favourite part about Saving CeeCee Honeycutt is definitely the people. They are all crystal clear and even if we’re not supposed to love them all they are all integral to CeeCee’s development so have purpose and add colour to the story. Towards the end I noticed how quickly I was reading and like I said earlier I was very sad when it was over. Thank you to Beth Hoffman for our review copy. All opinions are our own.